Mark Smith stayed unbeaten in this April 1987 game and his San Jacinto College team recorded another win - and clinched a conference title. Smith went eight innings, gave up two runs and picked up his 10th win to no losses, according to The Baytown Sun. Smith went on to go 16-1 that year, play at the University of Texas at Austin and in the pros. He lasted five professional seasons. He made it to AA, but no higher. 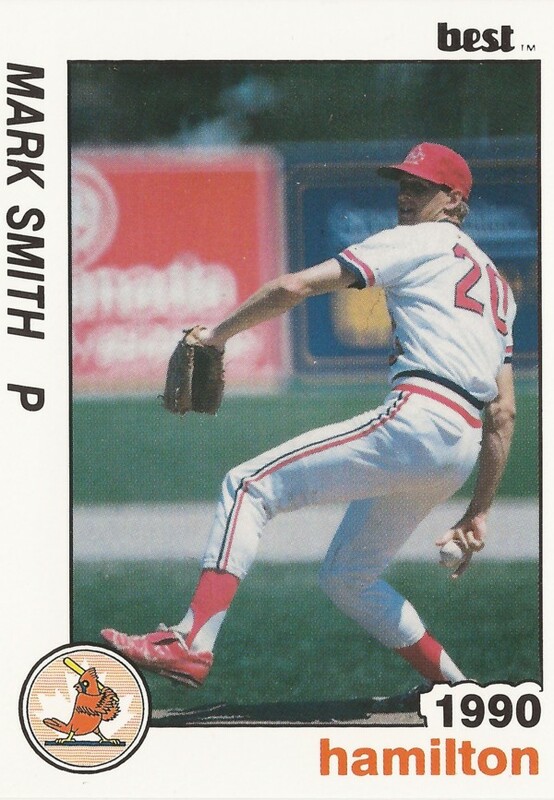 Smith's pro career began in 1990, taken by the Cardinals in the 10th round of the draft out of Texas. At San Jacinto, Smith excelled. He recorded that 16-1 record in 1987 and went 14-1 in 1988. He won first-team NCJAA All-American honors in 1987 and tried out for the 1988 Olympic team, before being cut in June. Smith then moved to Texas and then to the pros. He started with the Cardinals between single-A Springfield and short-season Hamilton. He went 6-6 between them, with a 3.99 ERA. He made high-A St. Petersburg in 1991 and then returned to Springfield for 1992 before moving to the Orioles system mid-year. He finished out that year at single-A Kane County, going 11-7 overall, with a 3.85 ERA. 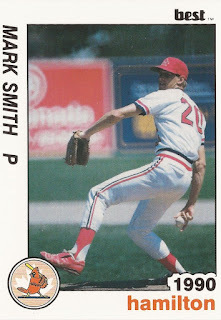 Smith played 1993 between AA Bowie and high-A Frederick. He went 5-7, with a 4.22 ERA in his final year in affiliated ball. He then finished out his career with 10 final outings at independent Mobile in 1994.